As a chief strategy officer or someone involved in business performance management, you know firsthand the struggles associated with getting your team (or more broadly, your organization) to execute on strategy. There are so many obstacles to overcome, including those associated with using Excel or PowerPoint as your performance management system. Fortunately, there is a way to save a tremendous amount of time and effort (and sanity!) with the use of an automated performance management system. 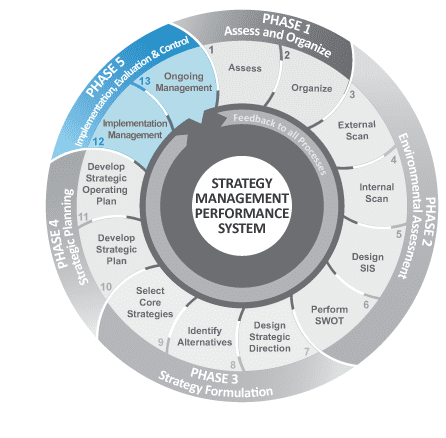 A performance management system is used to help communicate and execute your strategy across your organization and meet your strategic goals. This software solution will aid in the organized communication of your strategic expectations and guidelines, making employees more willing and able to participate in achieving your goals. Monthly or quarterly strategy reporting process. Management of goal, KPI, and project ownership. Managing these components may feel like too much to take on if you’re repurposing a tool like Excel. But when you use a performance management system instead, you’ll lighten your load and make the process much more efficient for everyone. Take a look at how software can impact the areas listed above. 1. You’ll clearly visualize your strategy. Strategic plans are traditionally written in a linear format: You list your goals, then your key measures, then your projects. But this isn’t always the most effective way to view your data; sometimes you want to see how your goals interrelate, which is difficult in a Microsoft Word or PDF document. A performance management software system allows you to build an infinite number of strategy configurations based on your audience. For example, if department heads want to see how their particular divisions are lining up with the larger organizational strategy, you can generate this report with only a few clicks. Yes, you can automate your measure and goal evaluation process in Excel—but it’s simply more difficult and less user-friendly than software. 2. You’ll quickly track ownership of information. Gathering information from various data owners around the organization is a headache for many strategy officers. It only takes one or two unresponsive data owners to make report creation nearly impossible. On top of that, having to pester employees for measure or project updates takes a huge amount of effort! A good performance management system can turn this process on its head and help you be more proactive instead of reactive. You can easily send out emails with links to information that needs to be updated each month. One click will allow all owners to get a custom list of their responsibilities and tasks. If they fail to complete those tasks in the time frame you’ve allotted, you can automatically generate a follow-up email that targets only those who haven’t yet updated their information. 3. You’ll easily report on your strategy. Automatically pull data from multiple departments and sources, making it far easier for everyone involved. Allow multiple people to simultaneously update their information and analysis, eliminating the concern that you—or others—won’t have access to the latest version. Standardize information or customize each measure, generating a consistent report with a couple of clicks. 4. You’ll seamlessly support your regular strategy meetings. Too often, team members leave a strategy meeting and go back to their day-to-day without a clear understanding of new decisions or assigned action items. This isn’t just a waste of time, it’s also a missed opportunity for executing on your strategy. In large part, this issue can be blamed on a lack of technology. If you use a solid performance management system you’ll be able to track the decisions made, link them to appropriate goals or key performance indicators (KPIs), and list any corresponding action items. Additionally, you’ll be able to plan the next review meeting based on these action items and check in on how past decisions have and will impact your strategy. Adding structure to your strategy will make you more efficient. Your strategy will only be effective if it’s properly implemented and executed—and one of the simplest, most efficient ways to do this is by integrating a quality performance management system across your organization. The structure will not only help you keep the entire company aligned with your strategy, it’ll also make your job much easier. Ted Jackson is the co-founder and managing partner of ClearPoint Strategy. He graduated with a Bachelor of Arts in Public Policy from Duke University and received his MBA from Harvard Business School. Ted’s background is in management consulting, having held high-level positions at Balanced Scorecard Collaborative and Palladium Group prior to founding ClearPoint.